One day a lady asked Ramana Maharishi (referred universally as Bhagavan). “Bhagavan is it possible to attain liberation through music alone or would other spiritual practices be required. ? "Bhagavan remained silent. .The lady further queried, “Did not Saint Thyagaraja and other saints attain moksha by singing the praises of God?" 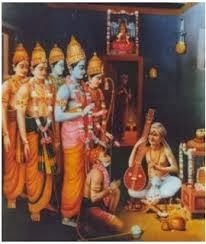 Bhagavan smiled,“Thyagaraja and the others did not attain Moksha through their songs but from the ecstasy that sprang forth from within as a result of their realisation of the ultimate. Their songs were just an expression of their blissful state. This was the reason why their music stood the test of time. This is what is called as 'Nadopanishad!"